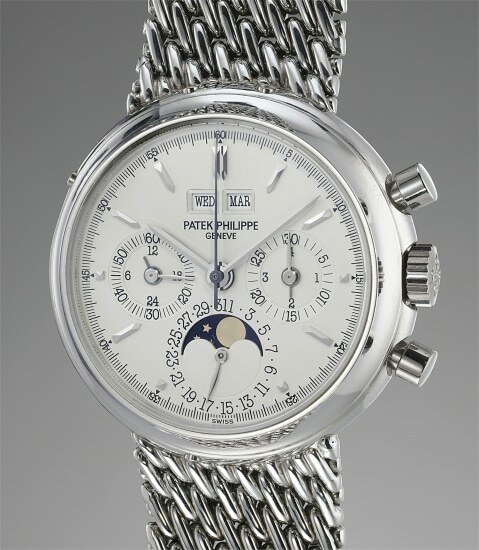 Reference 3970 is the third installment in the perpetual calendar chronograph line of Patek Philippe timepieces. Among the most typical complications from the brand, this family of watches is the only one which has been constantly in production since 1941 and features some of the most collectible models by the brand: reference 1518, 2499, the present 3970, 5970 and the current 5270. Reference 3970 was introduced in the late 1980s with a snap on back and soon upgraded to screw back for improved waterproofness. It was made in the 3 gold colors and - in more limited quantities - in platinum. It was usually supplied with a leather strap, although some rare examples such as this one feature an integrated bracelet. In fact, the present watch is only the second example in this configuration to appear at auction.